According to data from the World Health Organization and UNICEF, over 780 million people – or about one in nine – lack access to safe, clean drinking water. Millions of people die each year from water-related illnesses, and most of these are in the developing world. Since fresh water sources around the world are steadily dwindling while salt water sources remain plentiful, turning that salt water into potable water could be one way to help the growing water crisis. The small device seen above is a potential life-saver for untold millions. It is a simple, low-cost desalination device – a “chip” that removes the salt from salt water, making it suitable for humans to drink. 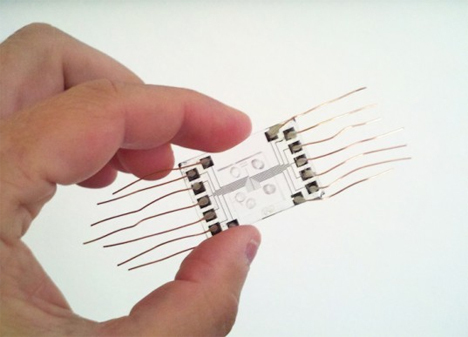 Okeanos Technologies was formed to flesh out the idea of a small chip that would use a weak electrical charge to remove the salt from salt water, using a mere 3 volts of energy. Each chip desalinates millionths of a liter at a time, a process called microdesalination. The process uses a form of energy called an electrochemical field gradient, a very effective method but one that can’t be used at macro levels. This may not sound like much, but the technology is modular in nature, meaning that hundreds or thousands of the chips can be used in unison to create fresh water for a person, a neighborhood, or a city – provided there is a source of salt water nearby. Each chip features a microchannel with two branches. An embedded electrode creates an “ion depletion zone” which neutralizes chloride ions, guiding fresh water down one branch and salt down the other. The novel approach to desalination is much less energy-intensive than standard methods and requires no post-treatment or membranes to operate. Other than the basic removal of sediment, no pre-treatment is necessary. Bacteria and viruses are removed by the chip as well, making the newly-desalinated water completely safe to drink. Okeanos hopes to eventually build a vending machine-type device that would operate as a standalone desalination plant to provide water for an entire village, no special tools or knowledge required. See more in Earth & Nature or under Science. June, 2014.